Looking for a quick cup of coffee? Need a gallon of milk, a dozen eggs, or a bag of potatoes? Want to order breakfast but have two kids strapped into car seats?! We’ve been there! 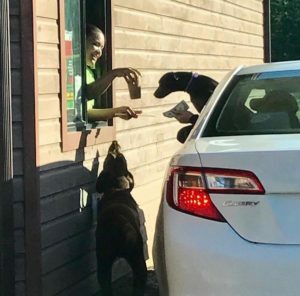 The drive thru is meant to make hard working people’s lives just a little bit easier. The drive thru is open whenever Barstow’s Dairy Store and Bakery is open. For the fastest service, call in your order ahead! Make it a bowl! │ order any of the burritos without the wrap! Looking to get a quick sandwich? No problem! We recommend for fastest service, however, you call ahead of your drive thru pick up! We’ll have your sandwich ready and waiting for you! Anything else you need! Let us know!